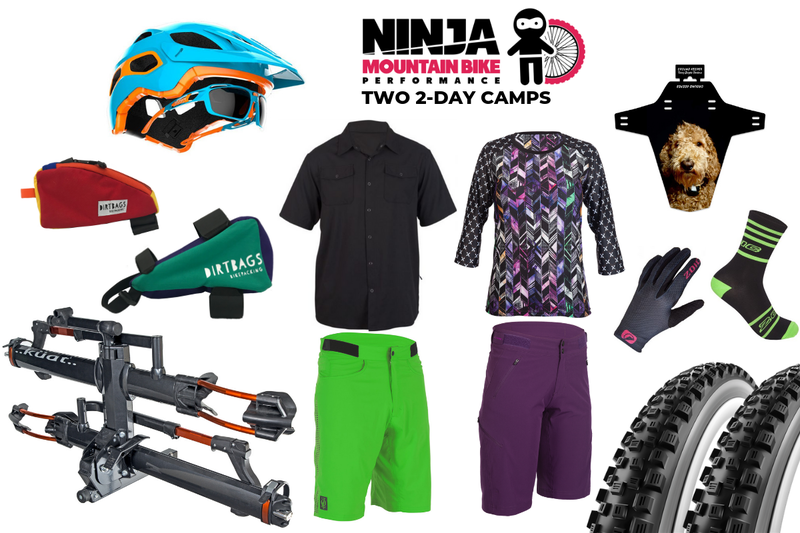 Ninja Mountain Bike Performance has teamed up with some of our favorite brands to get you and your best buddy ready to Ride Like a Ninja in 2019! February is the perfect time to make this year the most epic year of riding adventures yet. One lucky winner will receive two tickets to one of our 100+ 2-Day Camps along with a seriously drool-worthy gear package. If you’re due for some new skills and fresh gear, what are you waiting for? This is for you! You and a friend will join us for an epic and challenging multi-day camp that will get your riding faster and with more confidence! Our 2-day camp gives you a chance to build up and clean up your toolbox of mountain biking skills; from the fundamentals to wheel lifts, high-speed cornering, drops, technical features, we cover it all. And with over 100 2-Day camps in 20+ states nationwide, you can choose the location. The real question is, how will you ever decide – Sedona? Kingdom Trails? Bentonville? Packed with features, style and durability, the NV 2.0 is a favorite at the trailhead. It is a hitch rack imagined, designed and built with the most discerning enthusiasts in mind. Those who not only want, but need a rack capable of standing up to their daily (and extraordinary) lives. ZOIC Clothing has been perfecting the the fit, performance and style of mountain bike apparel for the last 25 years and now you can reap the benefits from head to toe. For the gents, the men’s Ether SL, the big brother to their best-selling Ether short, re-imagined in a sleeker, simpler design. Pair it with the Men’s Evolve jersey, a stylish performance piece that translates from the trail to the pub. The women’s Naveah short and Jerra jersey are the perfect combo for lady shredders who like to hit the trails, crush the downhills, and leave the boys in the dust. Your fresh kit will be complete with a padded liner, gloves, hat, and socks! The Sintryx sport sunglass and Protera mountain bike helmet are made for each other! Perfectly integrated to provide ultimate protection, unparalleled comfort and head-turning, Italian style. Ninja lead instructors ride in the Protera helmet exclusively because whether we’re teaching a clinic or riding with our friends, comfort, safety and style are top priorities and this helmet nails all three! Martello hammers home the performance you expect, on the most demanding Enduro and DH courses. Looking for the one tire to tackle a wide range of courses? This is the ticket. Whether shredding rocks, roots, or mixed terrain, Martello delivers! The Burrito Hauler is perfect for hauling your tools, snacks, electronics, and, well, burritos! Many hours of testing and burrito eating went into the creation of your new favorite bike accessory. Dirt Bags worked with enduro racers to design the Rippity Doo Dah to be super secure, keep your tools from bouncing around, and fit many full suspension as well as hardtail bikes. Win two fully custom Ground Keepers for you and a friend. If you dream it, they can print it! Always wanted to take your cat on a ride? Throw fluffy on a fender and get on with it! Ground Keeper Fenders are made with extremely durable and crack-resistant material and the graphics are as high quality and scratch resistant as it gets. Made in Bellingham, WA. For your chance to win, simply answer a few questions and click “Enter”. Your email address will be added to the newsletter mailing lists for the participating brands and you can unsubscribe at any time. Loved the Women’s Only Fundamentals Ninja course I took in Sedona. As a brand new mountain biker, I learned LOTS of skills I can practice even just in my back yard. I know that practice will make my time on trails that much more exciting! Can’t wait to take another course as I master these basic skills. Can’t wait to learn some new skills! !